My first thoughts about reviewing this musical were, ‘I wonder how they will do that?’ I realised this was because James Cameron’s film ‘Titanic’ (1997) has become so synonymous with the tragic story that it’s almost hard to separate the two: all of that water, so terribly depicted onscreen and such a defining feature (along with the classic ‘Jack and Rose’ on the stern of the ship image). So how would another rendering of the story of the Titanic go onstage? And what could make this distinctive and convincing? Thankfully, this version of the story doesn’t try to dazzle with huge scenery; it keeps things fairly simple. The backdrop is of sheets of steel with rivets visible – as if we are looking at the side of the boat. 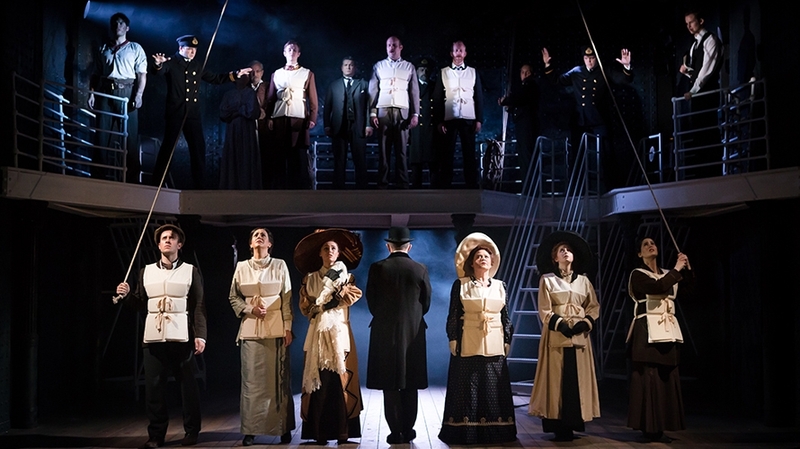 The unfussiness of the staging really allows the audience to focus on the individual stories of real survivors: a emotive lens through which to view this tragedy which continues to fascinate audiences over a century since the event took place. The stories focus on individuals but also couples and young families – from all social classes – and their reasons for being on the maiden voyage. Some, such as Mrs Beane, are social climbers, humorously attempting to gain entry to areas of the ship out of bounds to mere second class passengers. Then there’s the young women in steerage (third class) – all with their individual hopes for their futures in America. Their destination is very much painted as utopian and a land of opportunity. The musical numbers reflect this: jaunty, lots of singing in rounds. But the rounds which crescendo in happiness are later counterpointed by notes signifying the impending tragedy. Titanic: The Musical has a villain, just as every version of this tragedy does. Mr Ismay is portrayed as concerned with speed, claiming that Americans would happily see their dinners slide over the edge of the deck if they got to their destination more speedily. It’s hideously short sighted, as the audience knows with the benefit of history. The Captain is also portrayed as spending a little too much time and energy in the first class dining room, rather than paying attention to incoming telegrams about icebergs up ahead. The scenes with the Captain, Owner and Architect illustrate the rapidity and impressive progress made by engineering and the Titanic’s role in society of the time as being the zenith of human progress. The sinking of the Titanic, along with the start of World War I two years later, shook society to its core as nothing was certain. Society was changing and the world was changing, sometimes in the bloodiest and most tragic of ways. As we are poignantly reminded at the end with a large banner depicting the names of all those souls who lost their lives when the Titanic sank, this was a huge tragedy and the human error that caused it is thrown into the foreground in this show. However, the personal stories of the individuals who boarded the ship are commemorated and remembered too, and a fitting way to honour those who left Liverpool full of optimism and hope.